GROUP WELCOME: We will welcome and coordinate all hikers to go caravan/convoy from this location to the Red Rock Canyon park area. We will not leave cars here so please arrange any carpools prior to going to meeting point. WHY AREN’T WE MEETING AT THE PARK? – First, we need to make sure that all attending hikers have adequate water and snacks. Since there is a Gasoline Convenience Store next to the meeting point, this should help anyone who forgets any items. – Cell phone reception weak or absent in a many parts of the park. So we want to make sure everyone is together prior to arriving to the park. – You will be assigned to your caravan/convoy group from the meeting location. Not all hikers will be going to the same meeting at the park. These are not set in stone as you can choose how difficult you want most of the hikes to be that you attend. 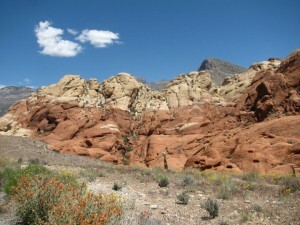 HIKE WALKTHROUGH: As a group, we’ll be visiting the Visitor Center, then heading over to the the first area (Calico 1). 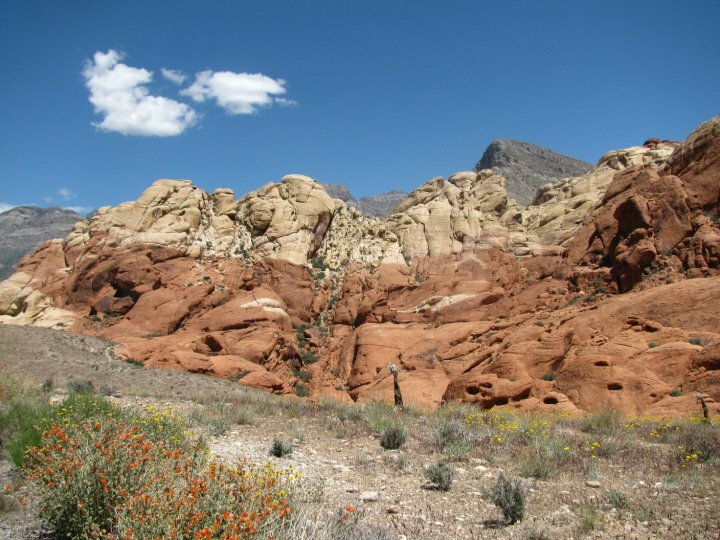 The group will spend some time exploring the first part of the park, where we actually see most of the Red Rock structures. You will have an allowed amount of time to go and explore this great area or Red Rocks. It will be an fun exploration that can range from an easy level to a moderate strenuous which can include boulder hopping and rock scrambling. You get to decide how difficult you want your hike to be while exploring. From there we will continue on to the From here we will bid adieu to any departing hikers who will consider this their hike and will continue on to a more challenging hiking trail that will be further out on the park’s loop. Expect to do more distance and some rock scrambling. HIKE EVENT TIME: 2 Hours – 6 Hours (approx), it all depends on how many hikes you go on. REQUIRED: At least 2 to 3 liters of water and a good sized lunch/snack. RECOMMENDED: Comfortable hiking shoes/boots, wear light clothing, warm layers, hiking socks, SUN SCREEN, backpack or camelpak, a snack, and 2 to 3 liters of water. ACCOMMODATION RECOMMENDATIONS: We recommend staying closer to the Las Vegas Strip. That way you’re closer to the meeting point. You’ll want to book near the area where you’ll be after the hiking event is over. – The LA Trail Hikers will not provide anything other than the meetup information for the guided hike. – All accommodations and travel arrangements are the responsibility of the attendee. – Please note that we are only leading hikes on Saturday, you can arrive before or leave anytime after the event as you wish. – We recommend checking http://www.retailmenot.com to get coupons to popular hotel booking sites. WEATHER: the weather is expected to by about 68*F (High). So it’s going to be on the cooler side (think of a cooler Fall day). — Read the hike’s detail page for this event. — Make sure your car’s tires are set with the suggested tire pressure. — Check breaks. Check oil, A/C, and Air filters. — Keep water handy to drink while you’re on the road. — Keep a few snacks handy as well. — You may encounter areas where radio signal is weak, so you may want to pack up some tunes (CD’s, MP3 players, etc.) to keep you going. — Carpooling to LV is highly recommended. — From the general L.A. area, it should be about a 4 hour drive. Depending on what day and time you leave. If you are leaving early from Los Angeles, we have a few recommended stops and detours for you to enjoy on your travel to Las Vegas (most are along the I-15). — Fill up your car’s gas tank PRIOR to arriving to meeting point. — Pack all your day’s hiking water and snacks. — Pack all your hiking gear and essentials. — Hat, (Hydration) backpack, sunscreen, light hiking clothes, extra water, comfortable shoes for hiking, and after hike snacks. — MAKE SURE YOU PACK A GOOD LUNCH FOR THE TRIP. — Leave unnecessary items back at your accommodations so you have plenty of space in your vehicle. — Parking at certain stops in the park may be limited in spaces, so please consider carpooling (consolidating car rides) on the day of the hike. Ideally prior to going to the meeting point. — Consolidate before you go to the meeting to the caravan to the park. — Make sure to use the restroom prior to arriving to the meeting point. — We’ll take about 1 hour to get to the park after we leave the meeting point. — We suggest you getting a good night’s rest on Friday night (don’t party the night before the event). — We need you to be 100% on the morning/day of the hike. — Alcohol in (or potentially in) your system is not good for our group atmosphere. Being hungover and dehydrated is not a suitable state to be in for this event. So if you do find yourself in this situation, we please urge you to reconsider attending the hike/event so you don’t make yourself an issue for the group. — You’ll have plenty of time to enjoy Las Vegas, or the rest of the park, after the intended event. — Please be considerate to other visitors and hikers. — Don’t leave any trash. — Pick up after your kids and pets. — No alcohol is allowed during the event. — Please park only in designated areas. — Have a fun time hiking.